Share the post "Different Treatment Options for Those Dealing with Fibroids"
Fibroids are benign growths in the uterus that can disappear with menopause. While they are benign, sometimes they can be painful, cause bleeding or complications with pregnancy. 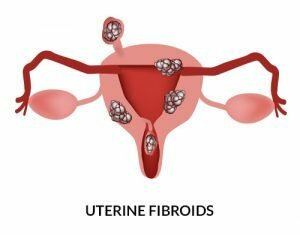 There are several treatment options, depending on the severity and number of fibroids, that you and your doctor may consider. If you have little or no symptoms or are nearing menopause, your physician may recommend watchful waiting. Another consideration to factor into the decision regarding treatment method is if you are wanting to preserve your fertility and are planning future pregnancies. Performed by an experienced physician, the procedure blocks blood flow to fibroids in the uterus. For women not planning a pregnancy in the near future, fibroid embolization is a non-surgical treatment option that can be considered. A catheter is placed in the femoral artery in the upper thigh. After injecting a contrast material, the physician will then be able to see the arteries that are supplying the blood to the fibroids. A solution of polyvinyl alcohol (PVA) is injected into the catheter to build up and block the blood flow to the fibroid. A short procedure (1-3 hours), fibroid embolization is a treatment option for some women who have not yet reached menopause, prefer not to have a hysterectomy and do not plan on becoming pregnant in the future. There is some pain associated with the procedure. This can be controlled with pain medicine in the hospital and with over-the-counter pain relievers at home. Also, there will be some residual vaginal bleeding. This is the fibroids breaking down. Some women have also reported passing the fibroid. If this occurs, you should contact your physician to ensure that there is no further bleeding and to prevent potential infection. The benefit of this procedure is that you will be able to return to your normal activities in a short period of time, usually seven to ten days. Also, the procedure requires no general anesthesia, belly incisions or blood transfusions. 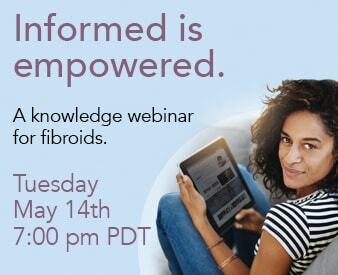 All fibroids may be treated at the same time. Even though fibroid embolization is an effective treatment and most women report an improvement in their condition, fibroids can return. One in five women had a hysterectomy within five years of having had a fibroid embolization. Infection is another potential complication that can develop following fibroid embolization. Other complications include premature menopause, loss of menstrual periods and scar tissue formations. As a treatment option, it can be as costly as a hysterectomy. If you would like to get pregnant in the future, fibroid embolization may not be the appropriate treatment. It is possible to become pregnant afterwards but it may be more difficult. Hysterectomy is the removal of the uterus. It is a proven, permanent solution to fibroids. It is, however, major surgery and future pregnancies will not be a possibility. Patients can elect to keep their ovaries or have them removed. If they are removed, menopause will occur and you will need to take hormone replacement therapy. If not treated with hormone replacement therapy, you could experience hot flashes and other menopausal symptoms. Also, without ovaries, estrogen production will cease and you will have a greater risk of osteoporosis. If you retain your ovaries, they will continue to function but their lifespan will be reduced. Minor complications can include mild pain, vaginal bleeding and urinary tract infections. The benefit to a hysterectomy is that it is a permanent solution to condition. The disadvantages are that it is a major surgery with a lengthy recovering time, pregnancy is no longer an option, and the potential of premature menopause. Another fibroid treatment option is myomectomy. This involves the surgical removal of fibroids while leaving the uterus in place. This procedure may also allow women to become pregnant in the future. There are several methods used including hysteroscopy, laparoscopy and laparotomy. The method that you and your physician decide is best for you will determine the length of your hospital stay and recovery time. For instance, hysteroscopy is an outpatient procedure while laparotomy will require a short hospital stay. Likewise, a lesser invasive procedure will require a short recovery time but the more invasive treatments require a recovery time of up to four to six weeks. There is a risk that fibroid will reoccur following treatment. Infection is also a risk. If you do become pregnant, a caesarean may be required for delivery. These are issues that you need to fully discuss with your physician. There are benefits to myomectomy beyond preservation of fertility. It can relieve anemia and pain that has not responded to treatment with medicine. It is also a useful treatment for a fibroid that has changed the wall of the uterus, potentially causing miscarriages or, in some cases, infertility. There are several treatment options available for fibroids. Each offers its own set of advantages and disadvantages that must be carefully weighed and discussed with your physician. Several important considerations are whether you have reached menopause, are planning a future pregnancy, the severity of the fibroids and the invasiveness and recovery time associated with each of the procedures. These are issues that need to be addressed with your physician and through careful consideration of your individual situation.